Forest Camo Rope Dog Leash with Stainless Steel Clip. Optional Carabiner available. Forest Camo Rope Dog Leash with optional Carabiner. Built with 10.5mm mountain climbing rope. Rope dog leashes are a perfect choice for medium to extra large dogs. Our Forest Camo Dog Leash as show in the main picture comes with a 3.5 inch marine grade 316 stainless steel clip. The industrial strength aluminium rope connections are covered in a black shrink wrap. We use only the best climbing rope manufactured in the USA to build all of our rope dog leashes. Dynamic climbing rope is commonly used to build rope dog leashes; these have an outer protective sheath woven in different colors and patterns giving the rope its finished look. This outer protective sheath is UV resistant concealing the inner nylon cords that give the rope its strength. We use only the best climbing rope manufactured in the USA to build all of our rope dog leashes. 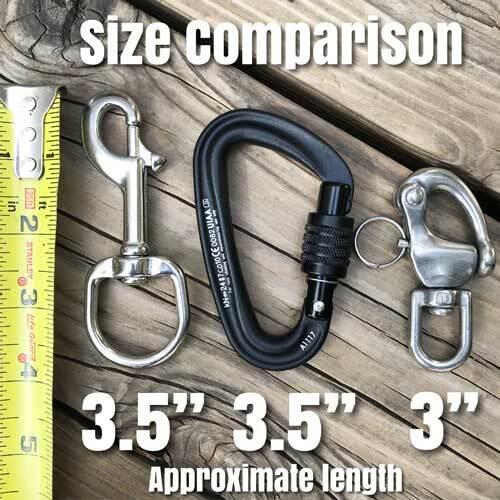 Large to extra large dogs requiring a rope leash with added strength and safety; upgrade to a professional 3.5 inch black compact locking carabiner. These are the same carabiners used in rock or mountain climbing. 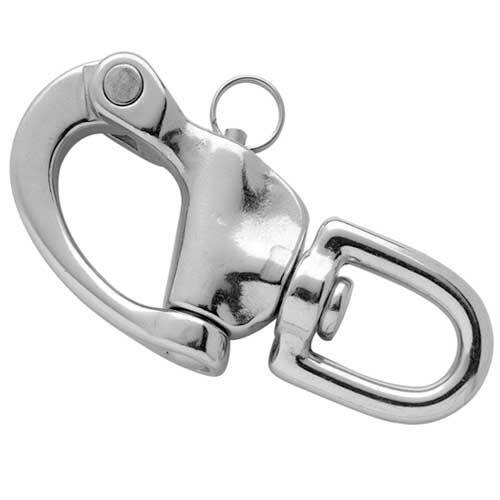 Please keep in mind that carabiners do not swivel like a standard stainless steel clip. We offer a professional nanoSwivel that works with a carabiner. Consider a professional upgrade for extra large or giant breed dogs, especially strong dogs that may have high prey drives, pull excessively, or simply just have the strength to pull you where they want to go. 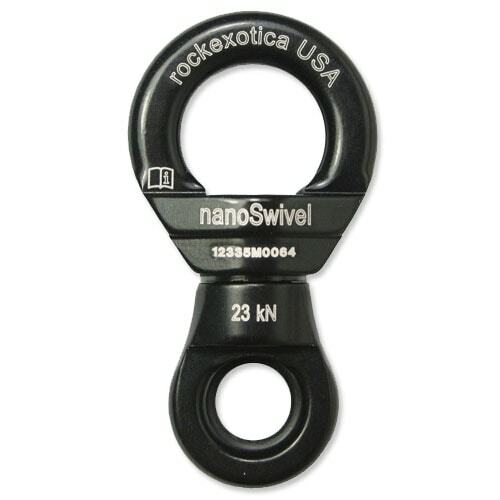 We offer a professional nanoSwivel that works with a carabiner, these are the smallest and lightest professional grade swivels available world wide, and designed specifically for professional rescue teams, firefighters, rock and mountain climbers. The swivels small size makes it perfect for rope dog leashes used with strong dogs. If you would like more information on this option please check out our Ultimate Dog Leash. Please understand that nano swivels are manufactured in limited quantities, these sell out quickly, a wait can be expected for this option. Ultimate Climbing Rope Dog Leash with Swivel and Locking Carabiner. Black Raven Climbing Rope Dog Leash with Carabiner. • Carabiner: 3.5 inch/89mm Black Aluminum Forged with Locking Screw Gate. Purchased Forest Camo Dog leash on style alone. MAN was I blown away. This is the best tool for any dog owner. USA craftsmanship at its finest. You cannot go wrong. Its hard to find a well made dog leash at most any pet store. You certainly won't find any made in USA and certainly not in the styles found hear at mydogscool. 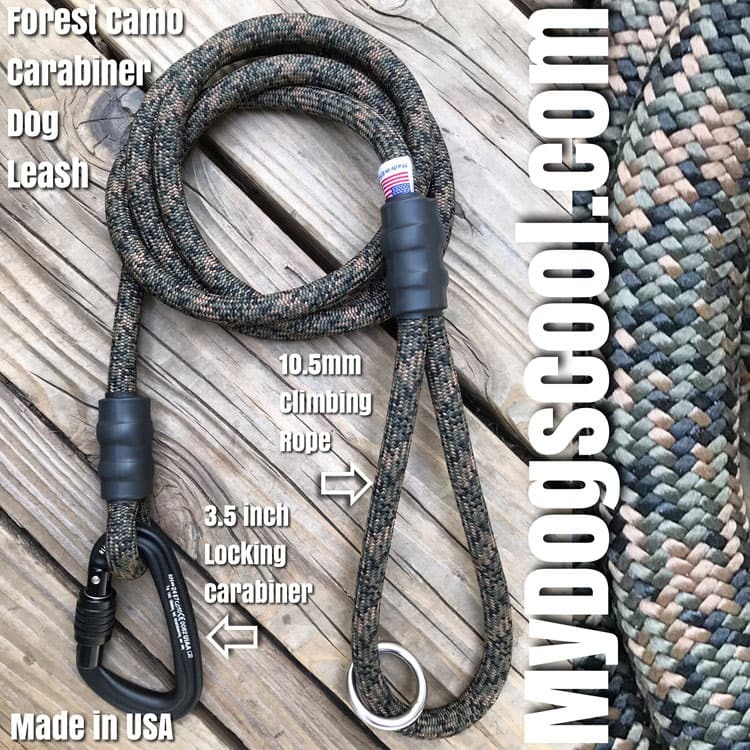 The Forest Camo Leash is well made and super strong. The stainless steel clip is a bit larger/stronger than what you see on most leashes and works nicely.